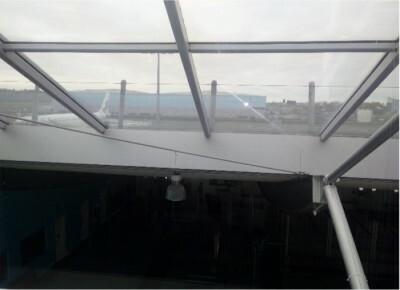 This is our review of the Breeze Priority Lounge at Southampton International Airport. 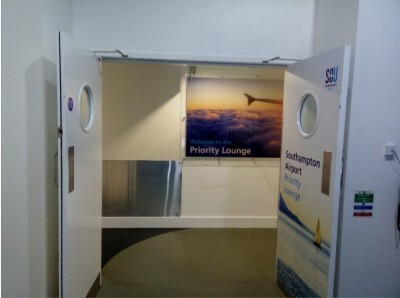 Here is reader Stephen’s review of the Breeze Priority Lounge at Southampton International Airport. 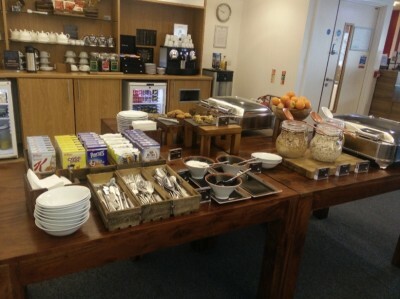 “The Priority Lounge is is the only lounge within the airport. It’s located on the first floor (lift available), past the Olive Tree restaurant and along two corridors. It is open 05:30 – 21:00 Monday to Saturday / 06:00 – 21:00 Sunday. I was welcomed by a friendly member of staff at the small reception desk inside the lounge. 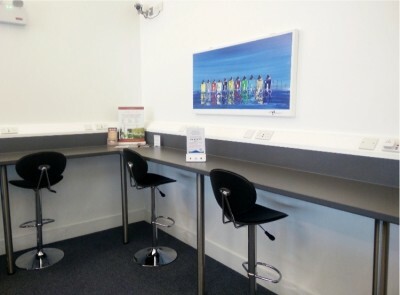 The lounge has a large and a small room, with the smaller room only opening as extra capacity when required. The main room was full of semi-circular armchairs which unfortunately weren’t too comfortable, and did not have access to plug sockets. 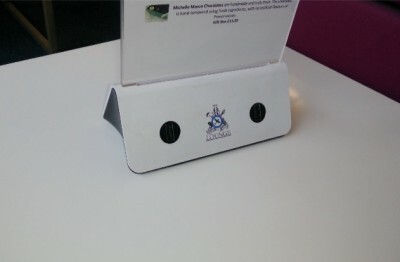 Some tables had an advertising board, which had the ability to charge USB devices. My flight was 10:15 and there were only 9 people in the lounge at 09:35. This is a “silent lounge”, so no flight announcements are made, but there are several screens displaying flight information. The lounge was bright, and looked down on the baggage reclaim area. The view from the large sloping windows was disappointing as you get a much better view from Costa on the 1st floor of the airport. There was a small business area in the main room with four seats for those wanting to sit and work with a laptop. There were plug sockets as well as “premium” WiFi but I’ve never had any problems with the free WiFi provided by the airport. They had a well-stocked Nespresso machine, some chilled fruit juice and water. 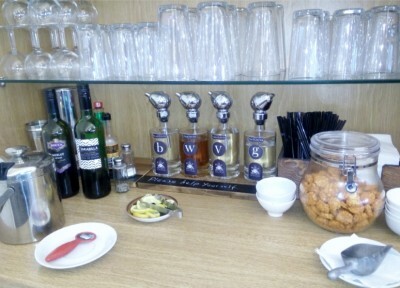 The bar was self-service with a small selection of spirits, wine and beers. A 200ml bottle of chilled prosecco is £5, and half a bottle of champagne is between £20 and £45. There is no bathroom inside the lounge. You have to leave the lounge, and use the toilet that is next to the restaurant (Olive Tree). Overall, this was a basic, quiet and relaxing lounge. I personally wouldn’t return, due to the poor value and limited food options. 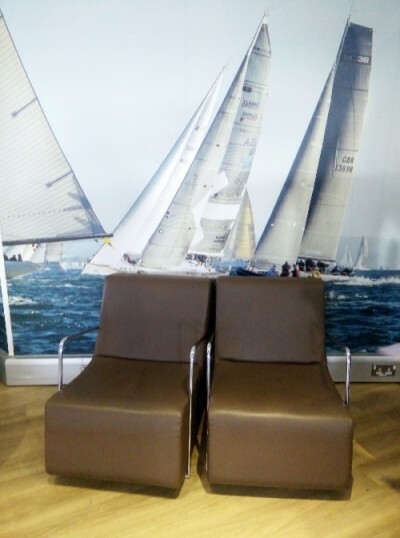 If I found myself with some spare time in this airport again, I would instead head to “The Olive Tree” restaurant / bar and then relax on these super comfortable chairs next to the departure gates! 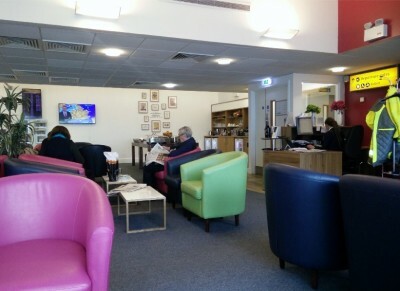 Do you get BA lounge access on Vueling, Aer Lingus, Flybe and AirBaltic?